I’m not one to discriminate when it comes to chili. I love it in all forms (beans/no beans, thick/thin, spicy/mild). I distinctly remember in 1st Grade saying my favorite food was “Chili Mac.” My heart has always held a special place for the combination of chili and pasta. Roughly three years later, I tasted prime rib for the first time and changed my answer. I can still see my teacher’s face when she read that answer aloud. I had a sophisticated palate, what can I say? Now, I’ve never been to Cincinnati but according to this recipe, this is how they eat chili. The spices include cinnamon and oregano (along with the usual chili powder and tomato bases) which give it its unique flavor. 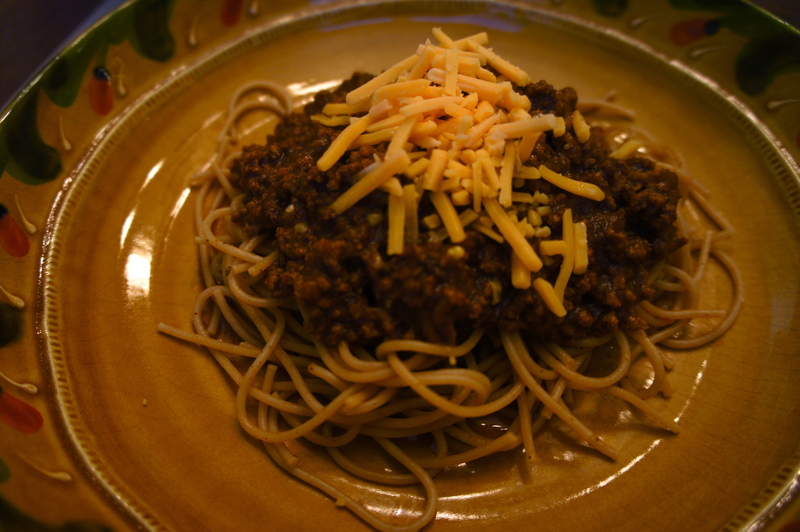 The consistency is on the thinner side allowing the spaghetti to soak up each morsel of chili. My inner first-grader can’t help going back for seconds. Heat oil in Dutch oven over medium-high until shimmering. Cook onions until soft and browned around the edges, about 8 minutes. Add garlic, tomato paste, chili powder, oregano, cinnamon, 1 teaspoon salt, pepper, allspice, and cook until fragrant, about 1 minute. Stir in chicken broth, tomato sauce, vinegar, and sugar. Add beef and stir to break up meat. 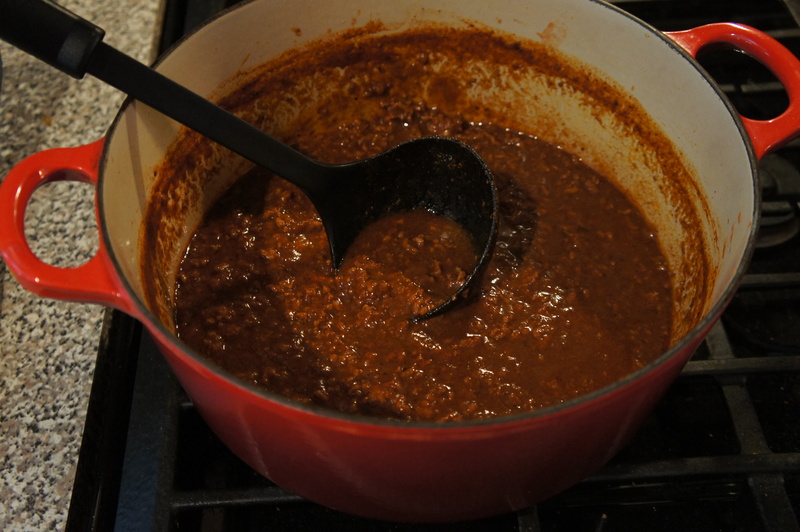 Bring to boil, reduce heat to medium-low, and simmer until chili is deep brown and slightly thickened, 15 to 20 minutes. Season with salt and pepper. In any case, keep up the posting and thanks for the recipes!